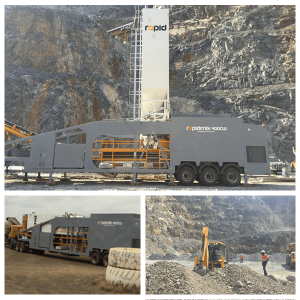 Rapidmix Mobile Continuous Concrete Mixing Plant / Pugmill Leads to Cost Savings on Mine Backfill Project in Tanzania. 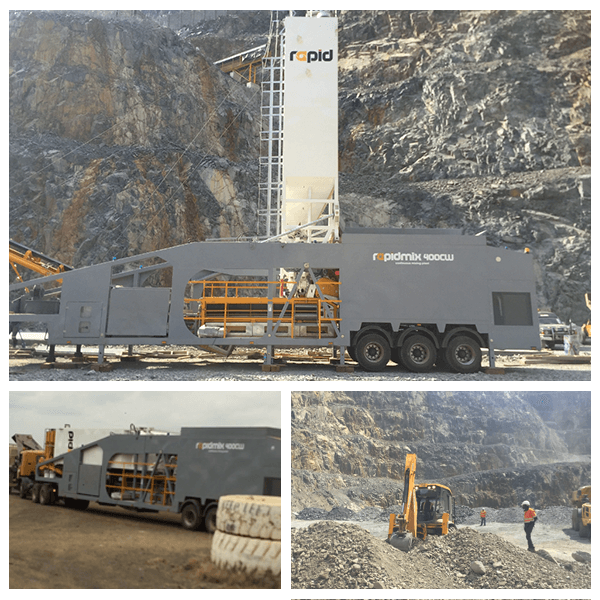 Rapid International Ltd (County Armagh, Northern Ireland) has recently supplied Kascco Construction Ltd (Mwanza, Tanzania) with a new Rapidmix mobile continuous concrete mixing plant for production of mine backfill within a mine in the North Mara region of Tanzania. Kascco Mining and Construction Ltd is a subsidiary of the larger Kascco Group, located in Tanzania, Africa and established in 2005. Originally a micro equipment hire contractor, Kascco Group has grown to be one of the leading mining, concrete, infrastructure and earthworks contractors in the Tanzanian construction and mining sector. Kascco’s primary business activities include construction of heavy traffic roads, drainage, road maintenance, pipe lines and culverts, as well as total solutions in mining, drilling, construction and earthworks services. The Group also provide long distance haulage and transportation across regional countries. Kascco purchased the Rapidmix 400CW mobile continuous concrete mixing plant for production of mine backfill in Tanzania, for one of Africa’s largest mining organisations. Mine backfill is the process by which material is used to fill the voids/cavities created by mining excavations. If the voids are left unfilled, this can create instability not only for extraction of adjacent pillars underground, but also above ground, leading to subsidence. Mine backfill makes effective use of waste rock extracted during the mining process by reusing it as aggregate within the backfill mix. There are typically four types of mine backfill: Dry Fills, Cemented Rockfill, Hydraulic Sandfill and Paste Backfill. Kascco selected to utilise a Cemented Rockfill as the backfill type. Cemented Rockfill is comprised of waste rock mixed with a cement slurry to improve the bond strength between the fragments of rock. In terms of mix design, Cemented Rockfill contains cement slurry concentrations at typically 55% by wt. and a mixture of coarse (<150mm) and fine (<10mm) aggregates. In this application the Rapidmix 400 CW mobile continuous concrete mixing plant mixed a pre-graded aggregate, cement and water to produce the backfill. The Rapidmix 400CW incorporates full weighing options for all materials – aggregates, cement and water – offering record keeping that is automated, precise and detailed.